Plans for the speculative new £20 million junction are set to leapfrog all other transport priorities in Swale including the completion of the Northern Relief Road and improvements to Stockbury Roundabout. 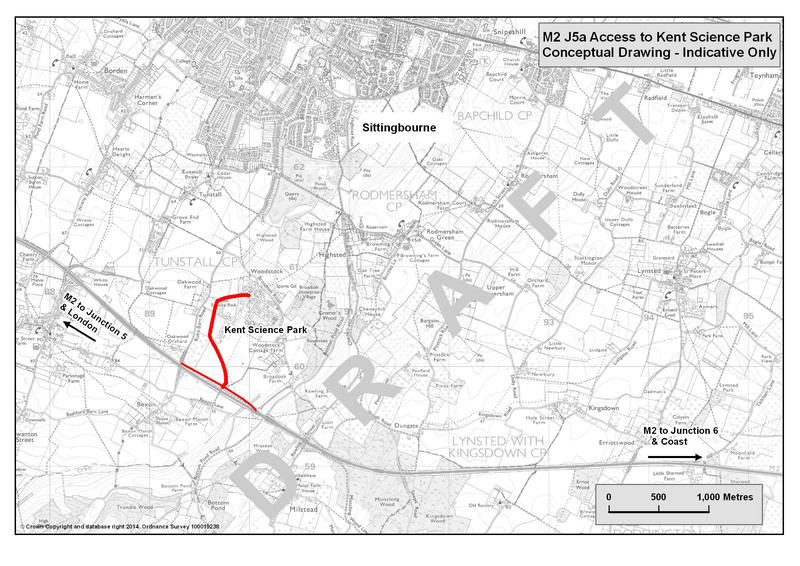 The so called interim junction arrangement would be for the exclusive use of employees of the Kent Science Park with no direct connection to the existing highway network and consist of a single on/off slip road from the coast-bound lane only. "The advent of the Single Local Growth Fund over the last few months, and the opportunity to seek flexibilities from Government has created the conditions for which an access from the motorway to the Science Park could potentially be delivered. Another key factor in this is that projects funded through the Single Local Growth Fund must deliver housing and/or jobs." "Kent County Council is supportive of improving access to the Kent Science Park in order to help facilitate growth in high skill/high wage jobs in the county. This is reflected in Growth without Gridlock, our 20 year transport delivery plan." "An interim junction off the M2 to form Junction 5a and access to Kent Science Park is not something currently in Kent's Local Transport Plan or Growth without Gridlock." Extraordinarily some members of the Growth, Economic Development and Communities Cabinet Committee who apparently gave approval for the scheme, appear to be entirely unaware of recent developments. Cllr Roger Truelove (Labour) told us "that this was the first he had heard of the plans"
The project has been signed off on the promise of some 1,800 new jobs, which would be created in addition to the 500 jobs attached to the outstanding planning permission granted in 2009 which has yet to commence. When asked about the evidence to support the case being put forward, David Brazier had to concede that at present the traffic modelling work is incomplete and the economic case had been complied by the Kent Science Park themselves. Cllr Andrew Bowles (Conservative), leader of Swale Borough Council expanded on this by suggesting "that this didn't matter because the South East Local Enterprise Partnership (SELEP) has the power to overrule Kent County Council on this matter." 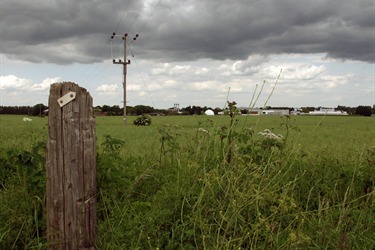 Kent Highways has made it abundantly clear that the site cannot be expanded beyond its current footprint plus the outstanding 4 Hectare expansion granted, due to the impact on the rural network. However the obvious drawback with the scheme is that any traffic originating from the west is highly unlikely to return via the M2 because you would need to drive to Faversham and back to turn round. 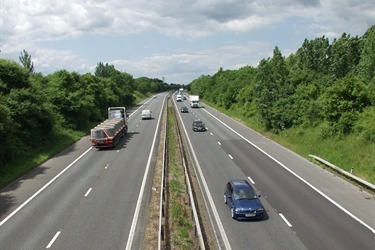 This not only has the potential to cripple the rural network, but is likely to impinge on the Town Centre, A2 and A249, and worst of all the M2 Junction 5 at Stockbury Roundabout . Cllr Mike Baldock (UKIP) told us “The Conservatives obsession with this ludicrous Junction 5a project seems to come at the expense of a proper focus on the Stockbury Roundabout, and the idea that public funds should be used to promote a private business on a highly speculative venture is simple shocking." View showing where new road would enter the science park. Questions have also been raised about the impartiality and lack of accountability that quangos such as the South East Local Enterprise Partnership represent and indeed it didn’t take much digging to unearth the fact that The Kent and Medway Economic Partnership (KMEP) which describes itself as “the Kent and Medway ‘building block’ of the South East Local Enterprise Partnership” has on its board none other than James Speck, Site Director at the Kent Science Park as well as chief supporter Cllr Andrew Bowles. the traffic problem at the stockbury roundabout hardly exists when the traffic lights are NOT working,when will the people who manage the roads realise this!. Another "hair brained" idea from KCC, based upon what the Science Park wants!! Do not go ahead with this idea Cllrs you would be foolish to try and spend 20 million of tax payers money in this way, when the town needs it in other areas. They do not have a clue really do they, of course the people from Iwade, Sheerness and the north of Sittingbourne will drive around the motorway to get to work... NOT!!! They will still use the country lanes and all end up going up Ruins Barn Road to avoid the congestion and the M2 junction 5 and Stockbury. This will not help Sittingbourne and it's inhabitants one little bit! Housing will have to follow in the beautiful countryside between Rodmersham, Tunstall and Bredgar to pay for this ill-conceived idea. Yet another fight for the Five Parishes and the local people.